Compared with other flow Casting Film Production Line, this machine is the easiest one and it has the characteristics of less investment, space saving, simple production technology, easy operation and labor saving. The machine can produce various kinds of table cloths, plastic gloves, shower caps, suit covers, umbrella base film, and can also be used for producing sanitary napkin PE base film, diaper film, perforated base film, various types of packaging film, and deep-embossed film. 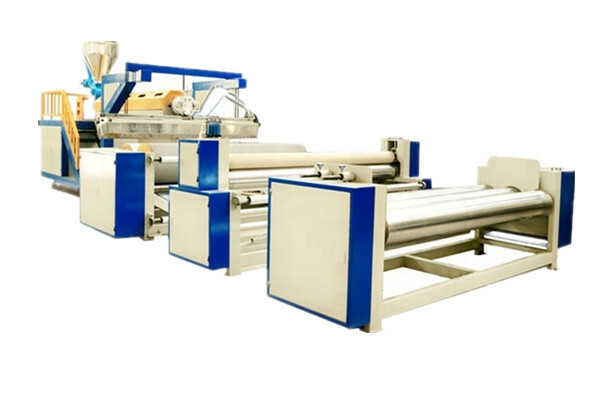 When extra unwinding device is added, this machine can be used as Lamination Machine. If you have any question about the simple flow casting film production line, please contract us directly. We will reply you as soon as possible. We are willing to take you to visit the factory. Looking for ideal Simplified Cast Film Machine Manufacturer & supplier ? We have a wide selection at great prices to help you get creative. All the Simple Plastic Machine are quality guaranteed. We are China Origin Factory of Simple Flow Casting Film Machine. If you have any question, please feel free to contact us.